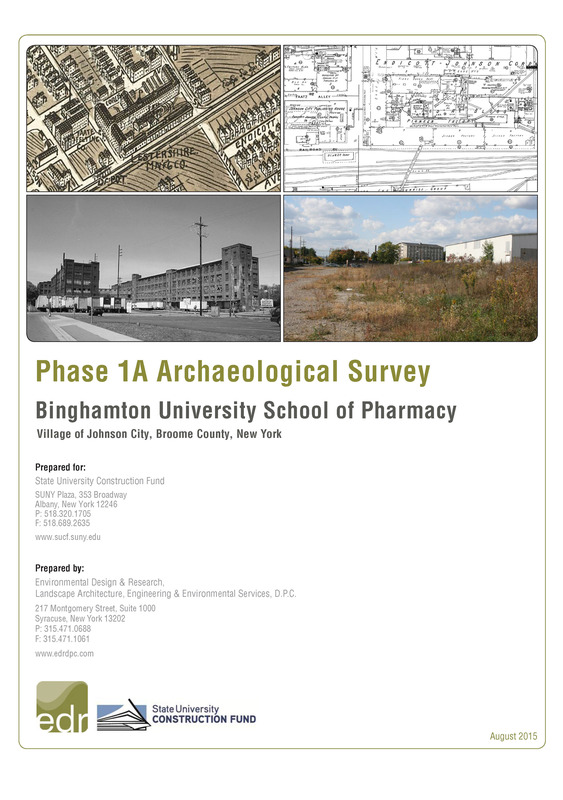 Binghamton University School of Pharmacy - Environmental Design & Research, Landscape Architecture, Engineering, & Environmental Services, D.P.C.Environmental Design & Research, Landscape Architecture, Engineering, & Environmental Services, D.P.C. Binghamton University’s new School of Pharmacy and Pharmaceutical Sciences, anticipated to be built by 2018, will be a transformative project for the Village of Johnson City in New York’s southern tier. On behalf of the State University Construction Fund, EDR coordinated the review of the project’s potential environmental impacts in accordance with the New York State Environmental Quality Review Act (SEQRA). This included preparation of a Full Environmental Assessment Form, or EAF, Phase 1A cultural resources survey and archaeological sensitivity assessment, and a Negative Declaration resolution. The 5.5-acre site is located in the Johnson City Historic District (listed on the National Register of Historic Places) and was the former site of an Endicott-Johnson shoe factory (demolished in 2012). EDR’s Phase 1A cultural resources survey considered both the compatibility of the project with the adjacent historic district as well as the potential for significant archaeological remains associated with the former factory to be present.